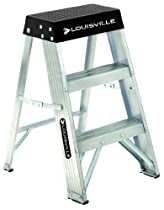 Heavy-duty, industrial aluminum step stool holds up to 300 lb. (Type IA rating). Molded plastic top provides large 6" wide by 12-3/8" long-standing platform, traction tread slip-resistant full-sized steps and pinch-proof spreaders. Bottom step has double-channel braces and molded vinyl foot pads riveted to siderails. I'm no little person my self but I have had a few "big boys" use it too. I currently weigh about 240lb 5'-11" and when I got it I was around 270. Even back then it never once felt like it was going to slip, twist, break or be anything other then a rock steady step latter on every kind of level surface. Some of the people that used it I'm more then certain exceed it's weight limits even without the tools they where carrying. It's vary light, I can easily put it in the back of a van or put it in a corner with one arm (though I'm not a "weak" person ether :p). I can't emphasize enough of how sturdy it is, every thing about it is heavy duty yet still light. As other reviews have stated it is a bit narrow but it more then makes up for that in how confident I fell when I'm up on it. I'm really not one to make a statement like this, but if your a bigger person and need a 2 foot ladder that's never going to wobble on a flat surface (or even one that's not all that flat) and is light weight buy this one. Don't waste time comparing others, just get it... Lowes or home depot may be a better price, but I would easily pay around $50 if I wasn't able to get it from a store. I'm not to happy on the price of the two side (below) but every thing I said about this one is 100% true for this one as well. I don't own it but I have used one. I needed some elevation (I'm 5'8'') to clean the roof of my SUV so I bought the step stool. I like cleaning my car instead of paying $20 for a job half done most of the time. Extra 2 feet was perfect for me. The steps are narrow and steep so if you are over 6 feet or have unusually large feet like other reviewers mentioned, the size maybe a problem for you. However, since it's compact it's easy to fold and put it to your trunk whenever you go to a car wash. The frame and truss are made of aluminum with decent thickness. I'm 165lbs and I feel it can handle 100lbs more without a problem. It's stiff and the rivets are tight so when you are getting on and off the tool it feels stable. The Vinyl foot pads are thick too giving good amount of stiffness. Note that if you don't have something to hold on when climbing or getting on the tool it's easier to do it sideways. Remember it's a step tool, if you use it for something else like in carpentry to hold large ply boards while you're cutting with electric saw, then it may not perform well or even may cause you an accident. For $40, I couldn't complain. Well recommended. I weigh 270+ and the stool is rock solid standing on top step. It is very light and easy to carry. The locks are well designed and easy to open. Just be careful and not pinch the skin between the thumb and fore finger. Solid construction with solid rivets. No nuts and screws to work loose. The two bottom steps are aluminum with no slip pattern in the metal step. The top step is a heavy hard plastic with a non slip pattern. The top step is one piece enforced molding underneath The plastic will not bend or wiggle. Solid as a rock. The feet are covered with a tough heavy flexible rubber plastic riveted on. No way can they slip off. Works great on all floor types..